The Bike Chester sportive includes some of the best routes through Cheshire we’ve experienced. The Bike Chester 2017 sportive was managed by the experienced team at Iconic Cycling Events and was supported by a variety of sponsors, including Redrow Homes, The Bike Factory and Halliwell Jones. The 2017 event took place on Sunday 11th June 2017 and the organisers have set a date of 10th June 2018 for the next event. 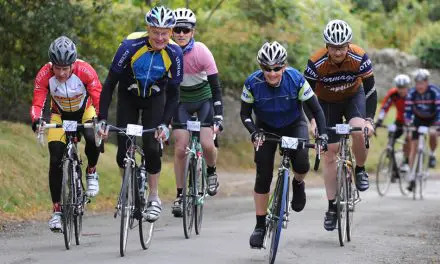 This Chester based sportive is included in our list of the best Cheshire Sportives so if you enjoyed this event, why not take a look for ideas for your next sportive? For 2018, the Bike Chester sportive has 3 routes; 25m, 50m and 80m routes, which is the same as last year. Elevations are pretty flat for regular cyclists with the most gain being just 2,700ft over the 80m route. This is a softer climbing option than the 2016 route, which covered 4,500ft over one of the two 80m routes. The shorter 25m route has just 1,125ft of climbing and the 50m route has 2,060ft, so nothing too difficult on any of the routes, just the outstanding Cheshire countryside to admire. Climbing: 2,700ft (80m route) Ride Profile: Rural country lanes. Start times were staggered to reflect the distances, with riders doing the 80m route being asked to start between 7.30am-8.30am, which then sees the 50m riders start from 8.30am, and finally the start time for the 25m route is 9.30am. All routes were clearly marked but it’s always advisable to take your own copy of the route map, either on paper or as a download GPS file (see links below). The event is a timed event but riders should be clear that this is not a race. The timing chips are merely to record times for your information. Bike Chester organisers provided feed stations, medical support, technical support, a finishers medal and post ride refreshments. In 2016, the routes headed South-West (80m), South (50m) and South-East (25m) but for 2018, the organisers sent riders out along a broadly North-East route. Both the 2018 and 2016 routes are listed for comparison or to download and ride again. I rode the 80-mile route in 2017 so I’ll focus on that as it’s the one I have first hand experience of, along with the same distance in 2016. First thing to say is that the Bike Chester Sportive have some of the best routes through Cheshire that I’ve experienced and as you’ll see from the Sportives pages, I’ve done a fair few. Like many sportives, it was an early start (7:30am) but as regular cyclists know, this is a great time to cycle on the roads as there are fewer cars. We set off from The King’s School in Chester, along Wrexham Road and into the City Centre. Being early, we were able to ride along the inner City lanes and take in some of the lesser known Chester Streets, some historic, some er, let’s just say a more modern reflection of inner City life. Riding out of the City, we headed North-East through Mickle Trafford, Bridge Trafford and on towards Manley. This section included the only real climb of the day, a 1.5-mile 200ft elevation, peaking at around 6% but only for a short distance. After Manley, there’s a descent into Norley and a steady incline to Hartford for the first feed station on the 80m route. It felt pretty early to be having a food stop after just 23m but this was a tactical stop at a Redrow Homes estate, who were sponsors this year so perfectly understandable. I really enjoyed the Bike Chester sportive and can compliment them on their organisational skills and highly commend them on their routes. However, there is one aspect that really let this event down for me, the food. 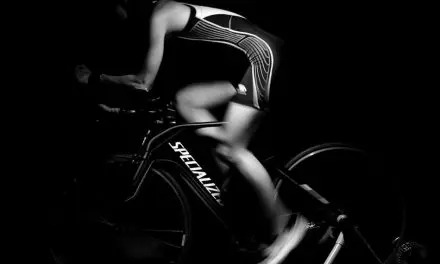 For regular sportive participants, you’ll be used to seeing flapjacks, jaffa cakes, malt loaf and oat based culinary delights of varied shapes, all of which are perfect for a long day in the saddle (slow release energy foods). I have never however, seen sausage rolls or cheese and biscuits. This isn’t a comment on the quality of the food, the sausage rolls were very tasty but it’s simply not the right food for a sportive. Thankfully I had my usual Soreen malt loaf with me. I wrote an article on the best snacks to eat whilst cycling, which gives some specific food examples to consider, including carbohydrate ratios. From Hartford, we continued North-East, cycled around Northwich and passed the Anderton Boat Lift (for those that know the area). From here, it was pretty straight forward cycling through some beautiful Cheshire countryside – the organisers really did get this route right, the only blip being the ride though Middlewich Town Centre, which was quite busy by this stage of an otherwise quiet Sunday ride. By the time we headed to, and then from, Middlewich, we were heading South-West and back towards Chester. On the day there was a slight head wind but one of the good things about sportives is that you can always find someone to ride with and share the headwind duties. There’s only so many times I can say that this was a really nice route so let’s jump forward and say we arrived back at the King’s School to a medal and a well earned sandwich. Whilst the 80m route was challenging from a distance perspective, I’d like to have seen a few more climbs for this stage in the Sportive calendar. Having said that, it’s always hard for organisers to satisfy every cyclists requirements so you can just put this one down to time-in-the-saddle, afterall, 80 miles is still a five to six hour ride for most of us. The Bike Chester sportive includes some of the best routes through Cheshire we’ve experienced so we’re retaining details of routes from previous years below. The route links aren’t maintained by us but they’re active at the time of publishing and we’ll keep checking periodically. Bike Chester 2016 offers 4 routes over 3 distances so cyclists have the choice of both distance and elevation, although neither of the longer routes contain any difficult climbs. 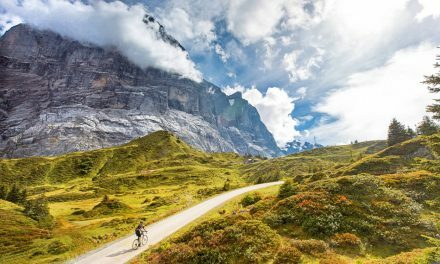 Excluding the 25m route, the elevation gains are 1,600 ft for the 50-mile route and 3,900 ft or 4,500 ft for the 80-mile routes. The two 80 mile routes are very similar, splitting just before the Vale of Llangollen at the 40-mile point, and then coming back together before the Horseshoe Pass climb. The Challenger route sees riders take on an additional 600 ft of climbing over the Sportive route option. The extra 600 ft has gradient peaks of around 15% but riders are rewarded with spectacular panoramic views of the Deeside moors, which make the extra effort more than worthwhile. Follow this link to download the 2016 80m Challenger GPS Route. 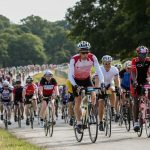 Whilst the Sportive route may not have the challenge of the additional 600 ft of climbing, it still demands effort and the necessary energy to complete the 80 miles. Leaving the Chester Rugby Club, riders head south towards Christleton and Waverton, mindful of the Saturday morning shoppers, although at 7.30-8.30am this may be prior to the rush. The route turns east to Dutton and then south for around 20-miles through Tattenhall, Chowley, Clutton and then across the English:Welsh border to Bangor-on-Dee. So far, riders have completed 30 miles but without any climbing, but this is about to change for cyclists who have choden the Challenger route. For cyclists selecting the Sportive route, there is a further 15 miles of broadly flat cycling until you reach Llangollen, and the only lump on the route – 900 ft of climbing over 3 miles. Riders stay above 900 ft for 8 miles before descending into Cefn-y-Bedd at the 60-mile marker. 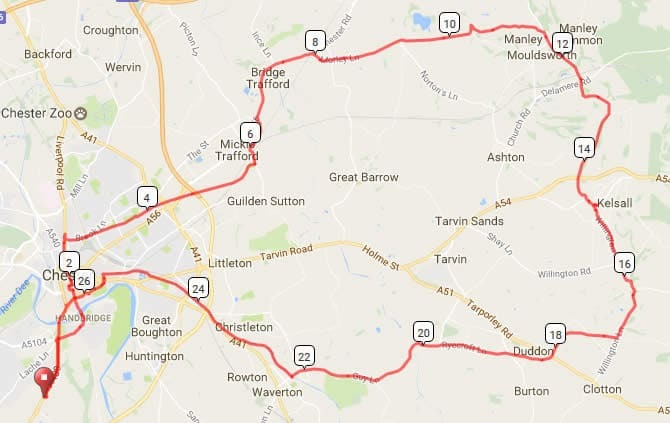 The route home is flat and takes riders through Gresford, Holt, Churton, Aldford, Saighton and into the now more established Waverton shopping traffic so be mindful of the uplift in the number of cars. Follow this link to download the 2016 80m Sportive GPS Route. Starting one hour later than the 80m riders, at 8.30am, the 50-mile route follows the same paths as the 80m route, through Christleton, Waverton, Dutton, Tattenhall, Chowley, Clutton and then across the English:Welsh border to Bangor-on-Dee. The most challenging aspect of the 50-mile route comes at the 17m mark, after Chowley, where there is a 200 ft climb over 1.5 miles. This makes a great sportive for cyclists looking to complete their first 50-mile cycling event. After Bangor-on-Dee, the 50m route splits from the 80m routes and heads north for 15 miles through Bowling Bank, Ridleywood, Holt, Churton, Aldford and then towards Huntingdon and the A55, although riders never actually get that far (unless you get lost!). At this point, the route rejoins the 80m route and heads back towards Chester Rugby Club via Saighton and Waverton. Follow this link to download the 2016 50m GPS Route. The 25 mile route shares non of the other routes but does allow riders to enjoy the Cheshire countryside. From Littleton, riders travel east toward Guilden Sutton and then south for a few miles before traversing the northside of Eaton Golf Club. After around 10 miles, cyclists pass through Burton and on toward Huxley and Brassey Green. One mile further on, riders turn west onto Grimes Lane and Tattenhall Lane prior to arriving in Tattenhall. At this point, the route goes north, passing the well-known Ice Cream Farm, which may make a nice stopping point on a warm day. Suitably refueled, riders have just 6 more miles to do before arriving back in Chester. Follow this link to download the 2016 25m GPS Route.